It was the end of March and summer was upon us when I decided to make a visit to Kaithoon, in a quest for Kota saris. I had been warned that it was definitely the wrong time of the year to make this trip with the sun beating down as strong as it always does, in most parts of Rajasthan. But having come to Kota—the city famous for innumerable coaching institutes of all kinds—it seemed too good a chance to miss out on visiting the village where my favourite brand of saris, the Kota Doria is woven. Kaithoon Village, is a little more than an hour’s drive away from Kota and the drive to was not too bad, thanks to the car A/C. I soon discovered that Kaithoon was more a town than a village, with a 50,000—strong population, evenly divided between Muslims and Hindus, who have lived in harmony for centuries. The spinning, dyeing and weaving are done by the Muslim families while the Hindus bring in the orders and market the finished product. Unlike the saris made here, Kaithoon can in no way be described as attractive. Most of the lanes are so narrow that very little sunlight filters through. There is dirt and squalor everywhere. Donkeys, goats, pigs and dogs roam freely foraging on the mounds of rubbish. But the people of the town seem unconcerned—they have their work cut out and are getting on with it. There was the sound of temple bells and at one end of a lane, there were women with prayer thalis, while at the other end, another group of women were winding thread on a complicated fencing of poles. Through a doorway I could see a young girl working on a spinning wheel and an elderly weaver at his loom. Everyone in town seemed busy, except some children, who decided to follow me. Their numbers grew so fast that I began to feel like the Pied Piper. Fortunately the driver of the SUV in which I had come, had decided to accompany me as a guide. After one yell from him, the children moved several yards away, but continued to follow us from a distance. As though to make up for the surroundings, the craft created here is really special. Interestingly in local parlance, the fabric is commonly referred to as Mysoria. This is because the original weavers had migrated from Mysore and were given shelter by the Kota ruler. Thus Mysore’s loss was Kota’s gain and Mysoria became the Kota Doria. A fairly complicated weave, in the Kota Doria, the warp and the weft is a combination of cotton and silk threads. The weave is created with one cotton thread, followed by a few fine silk threads and then another cotton thread and so on both horizontally and vertically, creating a fine chequered pattern. The cotton thread provides body and firmness while the silk thread creates the gossamer fine look of the fabric. These two types of thread come from two different places - the cotton thread comes from Madhya Pradesh, while the silk thread which earlier came from Karnataka, is now imported from Korea. There are also other weaves with complicated designs in a combination of silk and cotton. The standard Kota Doria yardage in sari width is always woven in white and then mostly dyed and printed—and often woven with narrow borders edged with gold. The thread for the planned saris, are dyed prior to weaving and most weavers insist on orders of at least three saris in the same colour/design, to make it worth their while. 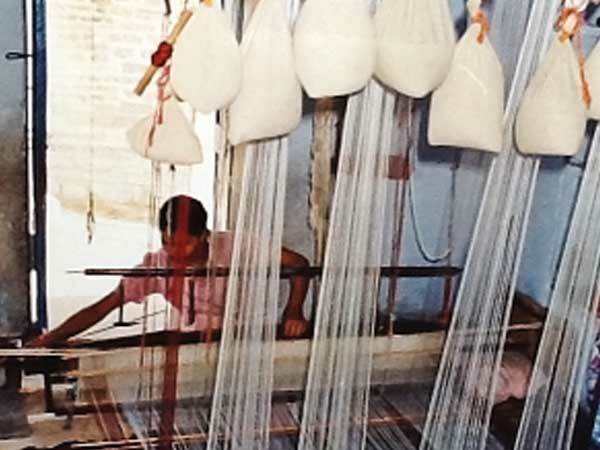 I watched with fascination the deft fingers of a young girl, as she effortlessly worked on a white sari with a gold border (part of a bulk order), managing with aplomb the huge loom with its thread suspended in bags. She was probably around 12 or 13, but handled her work like a veteran. Proving that as in all craft forms in India, the skill is handed down to the younger members of the family. Earlier the weaving was done by men, but now more and more women and young girls are taking over this task and making it into a cottage industry. This allows the men folk to work on other jobs to supplement the family income. The setting up of the thread on a loom is a very complicated process and can take the weaver almost an entire day. Three saris in a basic Doria can be woven in a week or so. While any complicated design can delay the process to double the amount of time, but then, the returns are also double. All the dyeing is done by men, with the thread being dyed in large basins of dye in different batches and colours and hung up to dry. The thread is usually given by the wholesale shopkeepers who then place the orders of a specific number of saris. After this fascinating introduction to the Kota Doria weave, I realised how much work goes into creating a Kota sari. It was time to make my purchases. I had many requests to fulfil—I chose rust and a blue for the two coloured saris with gold borders, for friends. Then there were two dyed ones in yellow and parrot green for myself and finally three white saris for a cousin who sells saris block printed saris. It was a day well spent and I was left marvelling at our country’s wealth of creativity as I drove away. I will certainly visit Kaithoon again.